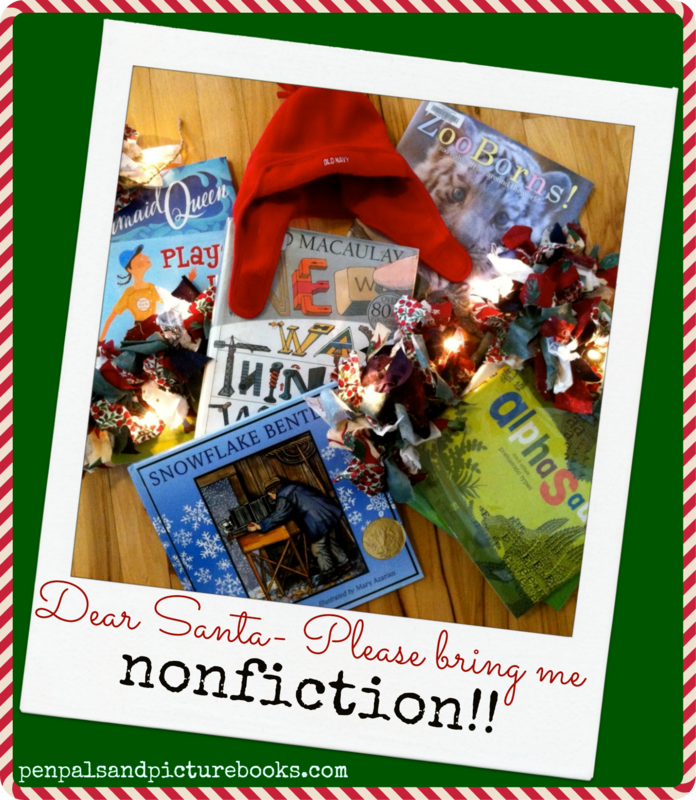 Pen Pals & Picture Books: Dear Santa, please bring me NONFICTION! Dear Santa, please bring me NONFICTION! Hey guys, Whitalics here. Guess what I'm gonna say--Okay, okay I promise I won't give you the countdown, but it's Wednesday again, you know what that means...Christmas is only getting closer!! Today how about some great nonfiction to wrap up and put under the tree? Did you know you can use Gatorade to clean a toilet? This is just one of the crazy tidbits in National Geographic Kids Weird But True books. I think these books would be a hit at our house. It's fun and funny trivia that kids (and adults) can't get enough of! Honestly, we can't talk non fiction without mentioning DK. Two new books of theirs that have caught my eye? First The Animal Book it looks absolutely beautiful. Second LEGO Play Book: Ideas to Bring Your Bricks to Life , it looks so so so cool! I could pour over DK books for hours and hours. If you have not seen Alphabeasties: And Other Amazing Types by Sharon Werner go find it now! You'll be astounded! Seriously, its so clever and well, just flat out awesome! I'm gonna be honest, I have no idea why I do not own this book and the others in it's series....that must be remedied...immediately! I'm really really obsessed with all things Steve Jenkins . First I wanted to tell you to get Actual Size . But then I saw he has a new book, The Animal Book: A Collection of the Fastest, Fiercest, Toughest, Cleverest, Shyest--and Most Surprising--Animals on Earth . So... I'm going to go ahead and advise you to get several of his books. When I think non fiction Gail Gibbons always pops into my mind. One of my kids very favorite Halloween books to read was this one . I don't have her Christmas Is... book yet, but I'm going to get it. I know my kids will love it. Last year Players In Pigtails was under the tree and Lilac just about flipped. I think Santa would be wise to drop more of Shana Corey's picture book biographies at our house this year, maybe the this one! I've already raved about National Geographic Readers series. They are all awesome! These books are saving my sanity as I explore the world of 2nd grade with my son. I'm fascinated by The New Way Things Work book by David Macaulay which has been around for quite sometime, but we just checked out from the library. We have some inquisitive little people around here, so this book is extremely handy! I was also excited to see leveled readers in this same how things work series. And of course, I can't let a winter season go by without paying homage to Snowflake Bentley by Jacqueline Briggs Martin. (This book has roots in the very beginning of my friendship with Whitney!) And it's beautiful, informative, fun and about snowflakes (which really truly are a miracle). So, yeah... it's one to own. Will there be any nonfiction under your tree? (I'm starting to wonder if there will be anything at all under ours...I better get crackin!) Guess what? I haven't bought/made/found a single gift for anyone yet either. Maybe Santa will save the day... Hopefully all of our lovely readers are doing better in the Christmas preparations than we are!